A week and a half ago, a half-dozen Los Angeles poets (Amelie Frank, Laurel Ann Bogen, Steve Goldman, Lynne Bronstein, Luis Campos, and Phoebe MacAdams Ozuna) launched a GoFundMe campaign on behalf of Holly Prado and Harry Northup, who recently lost their possessions in a nocturnal electrical fire in their apartment that nearly took their lives. Two hundred and twenty-five people have responded to the appeal, and slightly over $23,000 has been raised. The original goal was $20,000, and it speaks to the stature that Holly and Harry have within Southern California poetry that writers, readers, and artists have responded with such generosity to their need. If 75 more people contributed $25 each, the campaign would then have 300 total contributors to a $25,000 fund. I do want to reiterate that once they are settled back in their residence, it would help them immensely to have a working library again. I would like to suggest that Beyond Baroque hold a book party to which the poets and readers of poetry of Los Angeles contribute as many books as possible. One possibility would be to have a “library committee” of poets go through the piles of books, pick out volumes they believe would most interest Holly and Harry, and then invite them to make their choices, after which we could haul their new library to East Hollywood. The GoFundMe campaign to assist Holly Prado and Harry Northup has almost reached the $16,000 level of donations. The project is at the 80 percent mark. Over 170 people have contributed so far. If another forty or fifty people would make a small donation, we would all be able to savor the generosity of our community in helping two of our own recover from a devastating loss. Once again, my thanks to all of you who have helped these old friends. Harry and Holly met in the mid-1970s, shortly after I had published Feasts, Holly’s novella of “autobiographical fiction.” According to Harry, he felt inspired to meet Holly after reading Feasts. They have been inseparable since then. 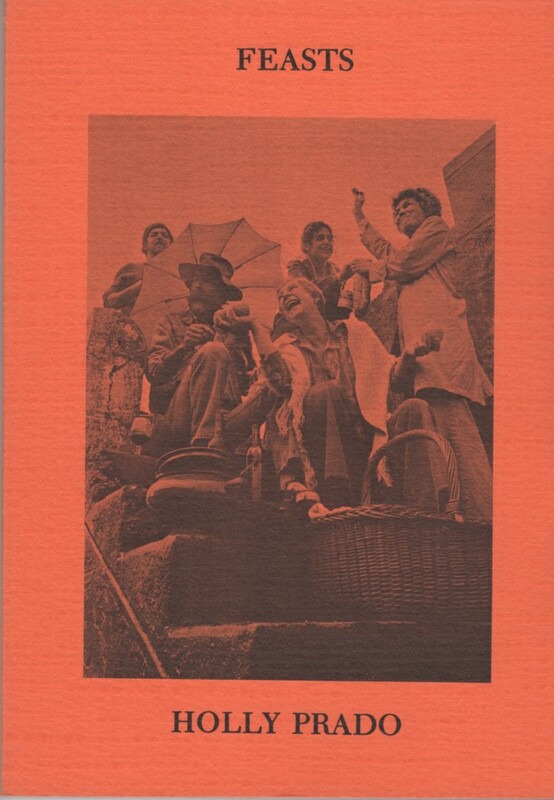 One of the most tantalizing books I published when I was the literary editor, production manager, and distribution agent for Momentum Press back in the 1970s and 1980s was Holly Prado’s Feasts, which I published in 1976. It’s hard to believe that Feasts is forty years old. Even after all this time, however, it still remains a difficult book to classify. A prose poem novella? Autobiographical fiction? A feminist text that serves as an early example of the use of journal writing as a source of creative self-definition? I suppose it is a bit of a fantasy to expect a book that has not been in print for over 30 years to appear in an annotated edition, and yet that is what this book needs and deserves. Without at least some commentary accompanying a reprint, a new generation of readers would probably not realize how important it is to go on-line and look up the Woman’s Building, the cultural center in Los Angeles that plays a major role in Feasts. Those who read this book without any awareness of the roman a clef quality of its social context will miss much of the ambience that it has to offer. I would like to go on record as having made efforts to get Feasts reprinted. Specifically, I have twice approached the Feminist Press in New York City, and each time have failed to receive even the courtesy of a form rejection. The first time they claimed that they never received the copy of the book I sent for their consideration, but the second time I handed a photocopy of the book to the editor along with a return envelope. No response. Perhaps there is some new feminist press out there that would be willing to undertake this project and include a long introduction and afterword. It is with this hope that I light a cake with 40 candles to celebrate my good fortune in having been its first publisher. I refuse to believe that such a marvelously intimate, tender and lyric piece of feminist affirmation will not be for sale again at Skylight Books. The AWP will have a major bookfair as part of its annual convention, which opens at the Convention Center in Los Angeles starting tomorrow. In general, the book publishers that are part of the AWP trade show are far more conservative than they imagine themselves to be. The sad truth is that I am not expecting any publisher at that bookfair actually leaving town in anticipation of reading FEASTS and seriously considering taking it on as a reprint project. Nevertheless, I post this notice in the hope that someone still cares about keeping avant-garde feminist writing available to the generation that might well elect the first female president or the first openly Socialist president of the United States.